Sweet and sound is a family business that puts the client first while performing the very best home inspection we can. Buying a home can be a stressful experience. Having a detailed, thorough home inspection by Sweet and Sound Home Inspections can give you the security and peace of mind that the home you want to buy is in safe and sound condition. "Choosing the right Home Inspector is a very interesting decision because in most cases, we will not meet until I actually am there to inspect your home. Different inspectors have varying qualifications, equipment, experience, reporting methods, and of course, different pricing. With that in mind, my promise to you is to provide the most comprehensive, detailed inspection presented in a format that is easy to follow and provides you with the information you need to make a confident decision regarding your property investment." For over a decade I performed nuclear inspections for the Department of Defense on the Navy's nuclear-powered aircraft carriers and submarines. I bring this same critical attention to detail that was required of this sensitive work to your home inspection. Knowing that if something is overlooked can mean the safety and well-being of your home and family, I put forth every effort to thoroughly examine your home and attempt to reach all visible areas so you can feel secure that your home was evaluated and examined to the maximum extent possible. I use only the latest state of the art inspection tooling and techniques to see, test, and evaluate your home and present that information to you in a post-inspection slide presentation and easy-to-read, detailed home inspection report. One of the most satisfying parts of my job is meeting new people and sharing the specifics of their new home with them. Your presence at the home inspection is both welcomed and encouraged. The best way for you to get to know your home is to see it through the eyes of your home inspector. I invite you to follow me through the process and learn the specifics of your home. Together, we can have you feeling secure that you have the knowledge about your home, and know the best way to maintain it. 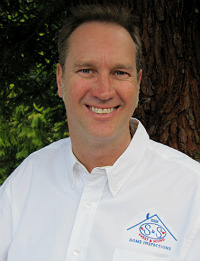 I have been fully trained and certified by the nationally-recognized American Home Inspectors Training Institute. With that, I bring the knowledge and techniques to fully examine your house with an eye of expertise. Additionally, I am licensed by the Washington State Department of Agriculture to perform structural pest inspections. Licensed by the State of Washington, I strictly follow the State's Standards of Practice (which I provide to all of my clients for review) and exceed all national and state industry standards with my inspections. You simply cannot get a better inspection performed on your home.